Japanese air-conditioner maker Daikin Industries fared poorly in the highly competitive Indian market till 2009. But then the company rolled out a well-crafted strategy to capture a larger size of the market. This case study takes a look at its remarkable turnaround story. Executive Summary: Japanese air-conditioner maker Daikin Industries fared poorly in the highly competitive Indian market till 2009. But then the company rolled out a well-crafted strategy to capture a larger size of the market. It succeeded in an incredibly short period of three years. This case study takes a look at its remarkable turnaround story. A dusty winding road, off the Delhi-Jaipur highway, leads to the sprawling 40-acre campus of Japanese air-conditioner (AC) maker Daikin's India factory in Neemrana. The town is known more for its six centuries old fort-palace, a weekend getaway for Delhiites. For Daikin, Neemrana has its own importance. It is close to its component makers in the Rajasthan State Industrial Development and Investment Corporation (RIICO) industrial belt. Also, Delhi, one of Daikin's key markets, is just 120 km away. The Neemrana plant makes 1,000 ACs every day for residential, commercial and industrial use. In many ways, the hustle and bustle at the unit signals Daikin's growing footprint in India. In 2009/10, Daikin sold 34,000 ACs in India, and ranked seventh among all AC makers. By 2012/13, this figure had grown a spectacular twelve times in volume to about 400,000. About 85 per cent of its sales are of residential ACs. Daikin has also increased its revenues manifold - from Rs 440 crore in 2009/10 to Rs 1,800 crore in 2012/13. It is now the second-largest AC maker in India after Voltas in terms of revenue, according to Registrar of Companies data available with the company. In 2013/14, the firm hopes to clock sales of Rs 2,200 crore. The AC industry is estimated to post a turnover of Rs 16,500 crore next year, according to industry estimates, growing at 10 per cent annually. The man who spearheaded Daikin's spectacular turnaround is Managing Director Kanwal Jeet Jawa. He has spent three decades in the AC business, and has been with the company since April 2010. "We have a product range no one can match - from 0.75 tonne to 2,700 tonne chillers," he says. But building a diverse product portfolio is only partly responsible for Daikin's success. The company has devised a five-point strategy which revolves not only around products, but also people, service, systems and the brand. The brand itself has undergone a metamorphosis. In 2000, when Daikin set up its operations in India, it was a premium AC maker. Its product prices were beyond the reach of the common man. Jawa realised this had to change if Daikin had to get a significant share of the market. But it was a long haul. In 2004, Daikin bought out shares of the Siddharth Shriram Group, which owns the Usha brand, to make the Indian unit a wholly-owned subsidiary. In many ways this was the turning point and Daikin began to focus more on its Indian operations. "It took them a lot of time to understand India," says Jawa. Daikin, then, imported residential ACs from Japan and Thailand*. However, costly imports did not allow them to scale up and become a mass market player. In 2009, at Daikin's headquarters in Osaka, the senior leadership put together a 150-page vision document, Fusion 2015, for the company in India. A new core team of 15, including Jawa, was put in place for its Indian operations. The same year Daikin did a survey on brand perception - 56 out of 100 people had not heard about the company. It started new campaigns to boost brand visibility. But the new team went for the kill, when it slashed the product prices by 40 per cent in 2009 and launched a series of products in the price range of Rs 24,000. The strategy worked and in 2010/11 Daikin doubled its revenue to Rs 850 crore. This phenomenon was new in the consumer durables space even though it had been seen in other sectors. For instance, foreign shoe brands, including Adidas, Reebok and Nike, had entered India at prices higher than domestic competition. They eventually rolled out products at lower price points to boost sales, though still at a relative premium to local brands such as Action and Tuffs. "Daikin has got the Indian ethos to AC making correct," says Harish Bijoor of Harish Bijoor Consults, a consulting firm specialising in brand and business strategy. "In India, the value for money connotation is very huge, and the opportunity is in the mid-level market." Jawa also realised that Daikin had to be present in many more towns and cities. In 2010, he called a dealers' meet at the ITC Hotel in Agra. About 350 dealers were invited and given the option to go to tier-II and tier-III cities by adding an additional dealership. "We were at that time selling to only the super rich, which is a niche," says Jawa. Within a year's time the dealer network doubled. At the end of the last fiscal, Daikin had 1,800 dealers. It expanded from four regional offices in the metros to 11 offices around the country, and it also opened godowns and smaller offices. "We were an engineering company and now becoming a marketing company, but we had to keep the engineering DNA intact," says Jawa. Daikin then unveiled a product - R32 refrigerant - in 2012, which allowed Daikin to use a smaller compressor, coil and other components, reducing the size of the AC by 30 per cent and offer it at only a 15 per cent premium over what its South Korean rivals LG and Samsung did. Meanwhile, the consumer durables industry was moving towards star rating, the standards set by the Bureau of Energy Efficiency. The more the number of stars (the maximum being five), the lesser electricity would be consumed. Daikin then developed an energy-efficient product which could sense the occupancy of the room, and regulate cooling and tonnage of output accordingly. It was initially launched as a light commercial product, but it is now finding a place in large apartments and villas. With lesser competition in this space - Mitsubishi and Toshiba are its only competitors - Daikin has a fair chance to be a leader. In China, Daikin has already cornered 45 per cent of the light commercial product AC market. In India, it claims to have already got half of the market and is aiming at 57 per cent by 2015. 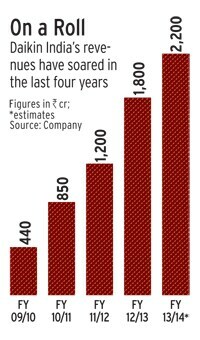 The turnaround in Daikin's fortunes in India is in large measure an outcome of higher localisation. Till about two years back, Daikin was only making commercial ACs and chillers in India, and was importing all its residential AC units from Taiwan and Japan. But Jawa realised that to bring down price, it was important to rely on local component manufacturers. Jawa had also learnt from experience. In 2010, a huge consignment of residential ACs got stuck in customs and needed to be delivered urgently to its dealers. Daikin was in expansion mode, and Jawa could not afford to lose time. The moment the consignment was cleared, Jawa got it airlifted and transported to various locations in the country, spending a big amount on transportation. The only way he could avoid such a situation in the future was by making the ACs in India. He started procuring components locally, and finally by 2012 Daikin stopped all imports and started manufacturing residential ACs at the Neemrana plant. Except the compressor and the controller, everything else in Daikin ACs are made in India. This, Jawa says, also has helped in reducing cost by about 45 per cent. Daikin is now set to expand operations. It has already invested Rs 743 crore in the Neemrana plant. The plant can manufacture up to five lakh ACs every year, but the current capacity will be fully utilised by the end of this fiscal. Jawa has already anticipated demand surpassing supply. He has got Rs 300 crore sanctioned from the parent to double the plant's capacity to a million units and take on other expansion plans in the country**. The company has also opened 100 exclusive Daikin stores, and there are a few more in the pipeline. The company has demarcated five acres of land in the plant facility for a training centre on soft skills and sales. For example, it is mandatory to pick up customer-care calls within 11 seconds. "We have our own bible," says Jawa. Daikin employees call it the Blue Book, and they abide by it. The Daikin management in Japan is obsessive about tracking growth. Every quarter, Jawa says, there is a review done by the Japanese parent. Every month there is a review by the Indian management, and zonal offices do their weekly review. Even though Daikin's growth is praised by some analysts, others look at it with scepticism. "This category is fast moving towards commoditisation," says Arvind Singhal, Chairman of the consultancy firm Technopak Advisors. "How much of that growth is sustainable is not known." This is largely because the AC industry per se can go through little innovation, say experts. It is also easy to replicate any innovation, which leaves little room for differentiation. For example, energy-efficient inverter ACs are in the portfolio of every company now. There are other challenges before Daikin. The Korean consumer electronics majors, LG and Samsung, have a larger distribution network and can reach out to many more people, especially in rural India. Other Japanese makers, such as Panasonic, have also slashed prices of products which might hit Daikin. Also, the three competitors mentioned above have a wider range of products which can give them an edge over Daikin, says Singhal. Jawa is unruffled. He has only one thing on his mind - meeting the goals outlined in Fusion 2015. The original plan, according to Fusion 2015, was to become the No.1 AC maker in India, in terms of revenue, by 2015. But the Daikin India chief has a slightly different plan. He wants to do it a year before target. "Given the current run rate, we will be there before 2015," says Jawa with a smile. And given his track record, it is difficult not to take him seriously. Daikin's strategy for growth in India has clearly shown results. They have achieved success in a short time by focusing on the large segment of valueconscious consumers. They are increasing brand awareness and selling high-quality products at competitive prices. At the same time, they have expanded their distribution network to make their products available and improve services. They are right in changing their orientation from engineering to marketing. It is not easy, and their success so far is remarkable. Their main challenge would be to sustain leadership in a competitive market. They can do so by becoming truly customer-centric. They seem to be following conventional wisdom in the industry regarding customer segmentation. They are changing elements of the marketing mix to provide better value than existing products. For example, they launched energyefficient products that adjust cooling by sensing room occupancy as light commercial products. However, people are adopting these products for residences as well. Therefore, there might be an opportunity for more effective market segmentation. Daikin must develop a deep understanding of customer needs and behaviour. They can start with the problem they intend to solve for the customer and then understand how customers solve it. Their focus should be on the entire cycle of purchase, use and disposal of alternatives to find hidden value elements. This knowledge would allow segmentation of customers in meaningful ways. They can then offer superior value to each segment through new technologies and products, and other elements of the marketing mix. This approach starts with the customer, not competitors. Overall, they are on the right path. However, the next phase of sustaining success would be more challenging. Since its entry into the Indian market, Daikin has succeeded in executing a long-term strategic marketing plan and has thereby emerged as a significant player in the AC market. Being a global leader, Daikin was obviously focusing on one of the most promising and emerging countries. The company had a solid action plan and transformed itself from an engineering company into a marketing one. The important lesson from this venture is the alignment of strategy with the vision and mission of the company. This is mostly dependent on the initial phase where identification and evaluation of opportunities in a marketplace is carried out. The five-point strategy devised by Daikin India chief Kanwal Jeet Jawa was very crucial in repositioning Daikin as an affordable brand. The incorporation of an Indian team helped this wholly-owned subsidiary to localise the product and reach out to a large number of customers in a short period of time. Localised production coupled with slashing of prices at the right time helped Daikin achieve a significant market share. Adopting this strategy in the consumer durables industry based on the experiences of multinational sports apparel companies was a unique initiative by the company which paid high dividends. The intensity of a formal marketing plan was evident with the widening of the channel partnership using the same dealers which eventually changed the niche market into a mass market. Although large numbers of exclusive showrooms are being opened and a service training centre has been set up to support staff, maintaining service quality will be a challenge in Indian conditions. The absence of stable power supply and associated problems are still rampant in the country which will have an impact on the AC market which is growing at 10 percent. Hence the company should be focusing on a more realistic approach than reaching the milestones ahead of time. *An earlier version of the story had mentioned that the company imported residential ACs from Japan and Taiwan. It has now been corrected to Japan and Thailand. ** The sentence has been updated to reflect that the sum of Rs 300 crore will also be used by the company to fund its other expansion plans.